New Delhi: After ransacking and trashing outlets of organized retail chains in various cities, groups opposing the entry of big firms in the retail sector are bringing their fight to the Capital with a series of protests outside modern retail stores on Thursday. 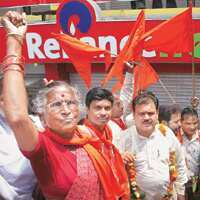 The traders’ group, Rashtriya Vyapar Mandal, that last month stormed Reliance Fresh and RPG Enterprises’ Spencer’s outlets in Lucknow, will stage a protest outside Reliance Fresh and Subhiksha outlets in East Delhi and the suburb of Noida. These stores compete with small, and often family-owned, grocery outlets. “We want to peacefully ‘lock’ the outlets," says B.L. Kanchal, the president of the group. Kanchal, however, warns that “anything can happen" if the police show any sort of high-handedness. He says his group has simultaneous protests planned in Mumbai and Ranchi as well. “People won’t sit idle if big corporates take their livelihood away," says Kanchal, who is also a member of the Rajya Sabha. Protests against emerging modern retailers that started as isolated incidents are picking up momentum and threatening to spiral into a nationwide movement as companies in the organized retail business face the ire of small hawkers and powerful politicians. The government has commissioned a local think tank to study the impact of modern retail on the numerous mom-and-pop stores that dot Indian neighbourhoods. The planned protest in New Delhi comes days after Uma Bharati, leader of the Bharatiya Janata Party’s splinter outfit Bharatiya Janashakti Party, wrote a letter to Mukesh Ambani, chairman of Reliance Retail parent Reliance Industries Ltd, asking him to close Reliance stores in Madhya Pradesh in two weeks or face action. Reliance Retail has emerged as a proxy target for people opposing the entry of firms in retail in many states, including Uttar Pradesh, Madhya Pradesh, Kerala, Jharkhand and West Bengal. Last month, Uttar Pradesh chief minister Mayawati ordered closure of Reliance Fresh stores pending a state government study to gauge the impact of modern retailers on the unorganized businesses. Also, Reliance was forced to postpone opening of its stores in Kolkata following opposition from a ruling coalition partner, the Forward Bloc. The nationwide backlash against modern retailers has forced other firms such as ITC Ltd to pare expansion plans. In August, small traders launched a “Quit Retail" movement to boot out modern retailers from the sector.